South Africa's ruling African National Congress has expressed fury at a court decision to ban the singing of a song with the words "Shoot the Boer". It says a campaign by white activists to get the song banned is an attempt to "elevate apartheid agents as victims". It wants the Constitutional Court to overturn a ruling by a white judge that the words amount to hate speech. ANC Youth League leader Julius Malema recently sang the song, leading to claims that he was inciting violence. South African's Afrikaans-speakers are known as Boers, a word which also means farmer. ANC Secretary General Gwede Mantashe told a media conference that his party would take the matter to the Constitutional Court. "These songs cannot be regarded as hate speech or unconstitutional. Any judgment that describes them as such is impractical and unimplementable," he said. 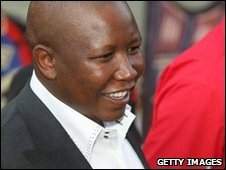 Mr Malema recently sang the song at a rally in Johannesburg, causing a row in a country where racism is still a challenge, 16 years after the end of white-minority rule. The mainly white Freedom Front Plus party and campaign group AfriForum want the courts to ban Mr Malema from ever singing the song and also want him prosecuted. AfriForum youth leader Ernst Roets says Mr Malema's actions were responsible for the recent murders of several white farmers in Gauteng province. "What we have here is an extreme form of hate speech - it should be prohibited according to South African law," he told the BBC's Network Africa programme. "It is simply immoral to try to justify a song like this, to say that it must be seen in context." The BBC's Pumza Fihlani in Johannesburg says some white South Africans want the song banned out of fear that it may incite attacks against them, while black South Africans, particularly those who took part in the struggle against apartheid, argue it is an important part of the country's history.